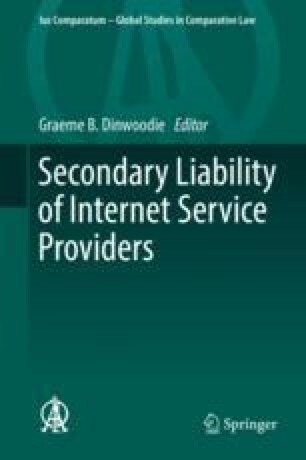 The laws of New Zealand disclose no consistent approach to the secondary liability of internet service providers (ISPs). Instead, the issue is approached in a piecemeal and pragmatic way. The lack of any generally-applicable definition of ISPs reflects this approach. Different definitions apply, for example, in the defamation and copyright contexts. Nor has a consistent approach been adopted toward the immunity of ISPs: again, different branches of law reveal different approaches. There is likely to be a number of causes for this. New Zealand is a small common law country that typically adopts a pragmatic and piecemeal approach to regulation. Secondly, the lack of generally-applicable international standards on secondary liability for ISPs means that a key motivation for law reform is lacking. Finally, New Zealand has recently amended its copyright legislation to introduce a graduated response regime in the context of file sharing. Because this regime provides a simple and relatively inexpensive process for imposing liability for primary infringement, it is now unlikely that a significant body of case law concerned with secondary liability will ever reach the New Zealand courts. Chair of Private Law, Victoria University of Wellington, New Zealand & Professor of Law, Melbourne University Law School, Australia. The author has served as a Member of the New Zealand Copyright Tribunal; the views expressed in this chapter are his own, and should not be attributed to the Tribunal. The author thanks Professors Bill Atkin and Graeme B. Dinwoodie for their comments on an earlier draft.